Mythology is filled with rare and wonderful creatures, but none as elusive as the unicorn. Wild yet shy, this creature was said to be impossible to catch, except by a pure maidens heart. Well, we may not have a live unicorn here, but we have a number of great unicorn statues and collectibles that will allow you to capture the essence of this legendary beast as your own! Everything in this category relates back to the unicorn in one way or another, either featuring some of its symbolism or featuring its actual image. And we offer more than just the traditional white unicorn. 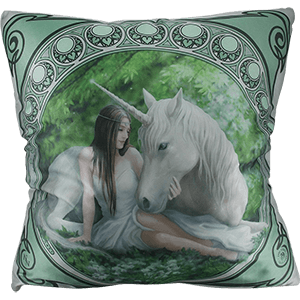 Shop unicorns of all kinds here, decorating all kinds of home decor items and collectibles. We of course carry unicorn statues, many hand painted and some made of cast bronze. But we also carry unicorn art scrolls, unicorn trinket boxes, and all other sorts of unicorn home accents, as well as unicorn t-shirts. Unicorns can be elegant, cute, or both, and our selection of unicorn products proves that. Bring one of the most beautiful aspects of fantasy into your decor or wardrobe when you shop our unicorn statues and collectibles. Unicorns are perhaps the most graceful creatures in all of fantasy. Bring the elegance and beauty of the fantasy horse into your home with our unicorn statues. We offer a wide range of unicorn statues here, including pegasus statues as well. Many of these unicorn statues are painted by hand and all have a phenomenal level of detail to their design. We offer winged unicorn statues alongside statues of fairy maidens riding unicorns. Our cast bronze unicorn statues make stately additions to fantasy collections and impressive home accents. We carry collectible unicorn figurines as well, perfect for placing on desks and shelves. Some of our unicorns are more gothic in nature, whether they have black manes and ride through darkened lands or they are accompanied by gothic maidens. 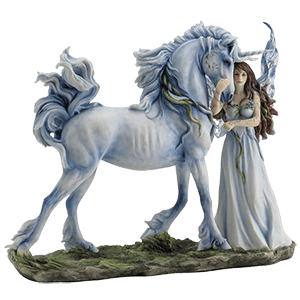 If you are seeking the next piece in your fantasy statue collection, or you simply love the magic and beauty surrounding the mythos of the unicorn, be sure to take a look through our selection here. Unicorns are known to be elusive beasts, only approachable by those pure of heart. That makes them excellent guardians for the small keepsakes and jewelry items that you hold dear! Check out our unicorn trinket boxes here, and you will find the perfect piece to both accent your home decor and gather your trinkets all in one place. We offer square unicorn mirror boxes and jewelry boxes decorated with breathtaking fantasy art and art tiles from the work of artists like Anne Stokes or Lisa Parker, as well as hand painted resin unicorn boxes featuring statuesque aspects on their lids or bases. For those fond of unicorns, there is no better way to organize your jewelry collections or small keepsakes than our fantasy horse trinket boxes. 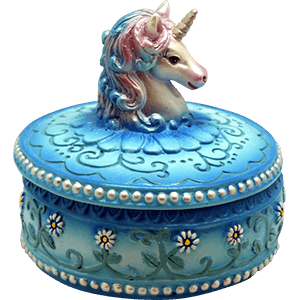 Bring a sense of the magic and purity evoked by a unicorn into your fantasy displays with these unicorn trinket boxes. Accent your everyday wardrobe with the wondrous nature of the unicorn when you shop our selection of unicorn t-shirts. We offer quite a range of graphic t-shirts here, and all feature unicorns at their finest, whether that means frolicking through a meadow, illuminated by the moon or a starry sky, or accompanied by a gentle fairy. So comfortable that you will want to wear them every day, we have unicorn t-shirts in a variety of sizes and made for both adults and children. 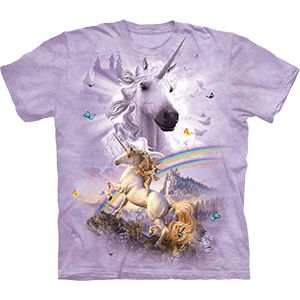 Our unicorn t-shirts often feature artwork by Anne Stokes, Lisa Parker, and other well-known fantasy artists, making them essential gorgeous pieces of art you can wear on any day! If your casual outfits could use an extra element of magic, wear one of our unicorn t-shirts.